Made from coconut, a nutritious superfood, these functional tasty treats are great on their own, or added to oatmeal, salads, or anywhere you need some crunch. 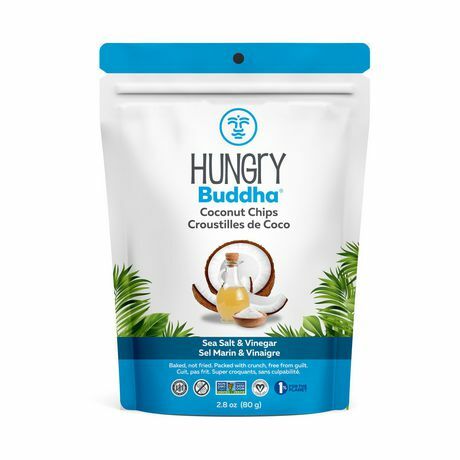 Hungry Buddha Coconut Chips are a source of healthy fats and dietary fiber that fill you up with nourishing energy, and keep you feeling full long past snack-time. 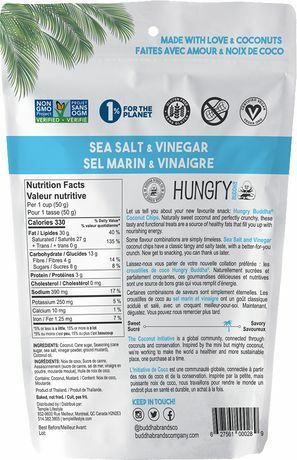 Sea Salt & Vinegar coconut chips have a classic tangy and salty taste, with a better-for-you crunch. Free from GMOs. Vegan certified and naturally gluten-free. Baked, never fried. Peanut-free. As passionate members of 1% for the Planet, we give 1% of our sales to environmental and social causes. Oh, and did we mention they’re delicious? Now get to snacking, you can thank us later. Gluten free. Non-GMO verified. Vegan certified. Baked. No cholesterol or trans fat. Buddha Brando Company is a proud member of 1% for the Planet. Coconut, Cane sugar, Seasoning (cane sugar, sea salt, vinegar powder, ground mustard), Coconut oil.